Yesterday three generations of the Campbell clan enjoyed a visit to this year's SWING narrow gauge show in Bognor. The show, which has built a reputation for quality layouts and a friendly atmosphere, has moved to a new and bigger venue this year. That has allowed more traders and layouts, but not all of those were narrow gauge - there were some standard gauge layouts and general traders - making it into a sort of hybrid show, like a typical club show but with a strong NG influence. I guess that widens the appeal to local modellers, though it does dilute the feeling of an NG show a little. It was good to see traders specialising in scenics, not often seen at NG shows, and there was no shortage of NG traders too (including KB Scale and Narrow Planet this year), nor indeed any shortage of NG layouts. Amongst my better photos is this one of (I think) The Orchard Line in GN15, by Simon Andrews, showing the amount of detail possible in a small space using this scale. John Thorne's Bottle Kiln Lane (009) is always a popular layout, with excellent scenery and a fascinating range of locos. Wisteria Collop (009) by David Simpson has an emphasis on scenery, which is superbly done. Q Dump in 1:35 on 16.5mm gauge, by Nigel and Sue Tansley, portrays the WWI 2' gauge railways serving the Western Front, in this case somewhere in Belgium. There's a high level of observation and detail in both the scenery, and the accurately modelled trains, while the operators were actively engaging in conversation with viewers to explain the history. This was my son's favourite layout, and I can see why. My favourite was Melinau'r Abaty (O-16.5) by Chris Featherstone. Identifiable immediately as a Welsh slate railway, it is heavily influenced by the Corris railway, but with locos and stock from other Welsh lines looking at home together. The layout featured a working stub point and rope-shunting (I kid you not) and really captured the atmosphere of such lines. For more photos click here. So despite the changes associated with making the show bigger, it's a show still worth making a trip for. This month's 009 News contains my article on modifying the Eggerbahn OEG coaches. Regular readers may remember the build on this blog. 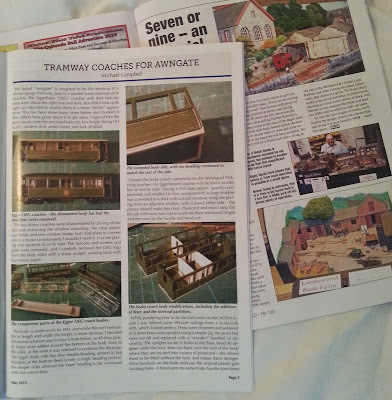 Also this month I picked up a copy of Narrow Gauge World, and to my surprise found a picture of Landswood Park in the modelling section. The article was discussing different scales and the picture illustrated 7mm NG in a very small space - and it's nice to see the layout still attracting attention!